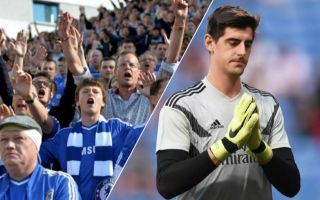 Chelsea fans flocked to Twitter to troll former player and current Real Madrid star Thibaut Courtois, after the Belgian’s howler at the death saw Alaves beat Los Blancos 1-0. Courtois swapped London for Madrid this past summer, a move that didn’t really go down all too well with Blues fans. The Belgian international’s life so far in the Spanish capital hasn’t exactly gone to plan thus far, as he’s only been able to help the club secure a handful of wins, as well as failing to cement a first team spot under Julen Lopetegui. This will surely put a smile on the faces of some Chelsea fans, and they’ll be smiling even more after the mistake that Courtois committed today. The former Blues star was left in no man’s land at an Alaves corner, something that saw the Spanish minnows score the first and only goal of the game in the 96th minute to condemn Real to their second loss in a week. This moment had Chelsea fans laughing, with a lot of them taking to social media to troll their side’s former player for his mistake. Here are a few select tweets from those Chelsea fans trolling Courtois for his blunder this evening. Meanwhile courtois can’t get a clean sheet. Looooooll ???? We really have to commend courtois for leaving it late and eventually gifting alaves all three points.. Elite goalkeeper..
Chelsea fans mocking Courtois for Alaves goal. He did a world class save in first header tho. But I stand corrected that Sergio Ramos isn’t that good. His goals cover his weaknesses as a defender. Chelsea fans tearing into Courtois and me RTing ??? ?